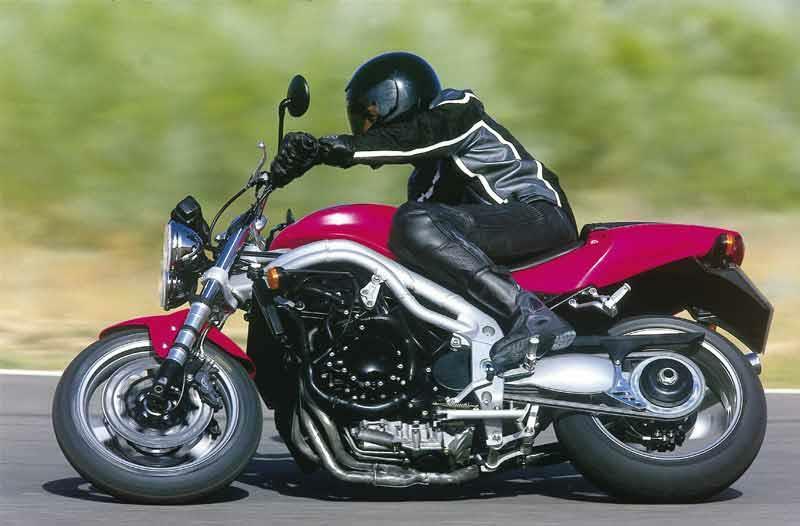 The Triumph Speed Triple is one of the second generation of Hinckley Triumphs that, in the late 1990s, really put them back on the map. The Speed Triple is essentially a naked, upright, ‘streetfightered’ Daytona, but it’s a surprising winner that’s not only brimful of bad boy character, but also manages to employ the wonderful and unique 955 triple motor into a exciting and versatile package. 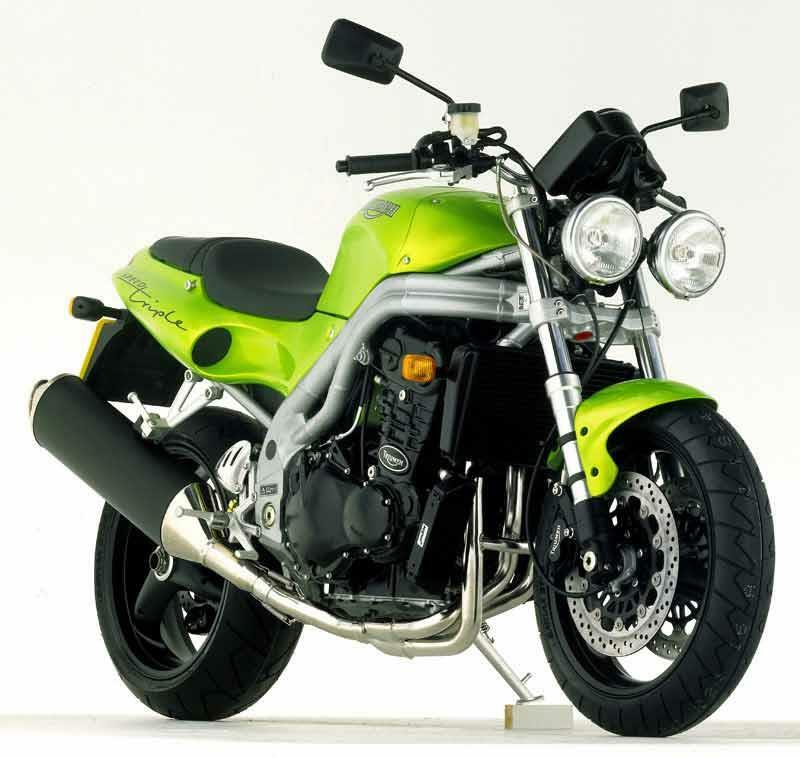 The second generation Triumph Speed Triple is one of the best. There’s nothing on earth quite like the fruity and fast second generation Triumph triple. As you might hope, this layout is a happy compromise between the easy, flexible torque of a twin and the free revving power of a four. In sportsbike mode the Triumph Speed Triple has always been a little lacking somehow, but as a streetfighter it’s an absolute blast bettered only by the superceding 2005 1050 version. 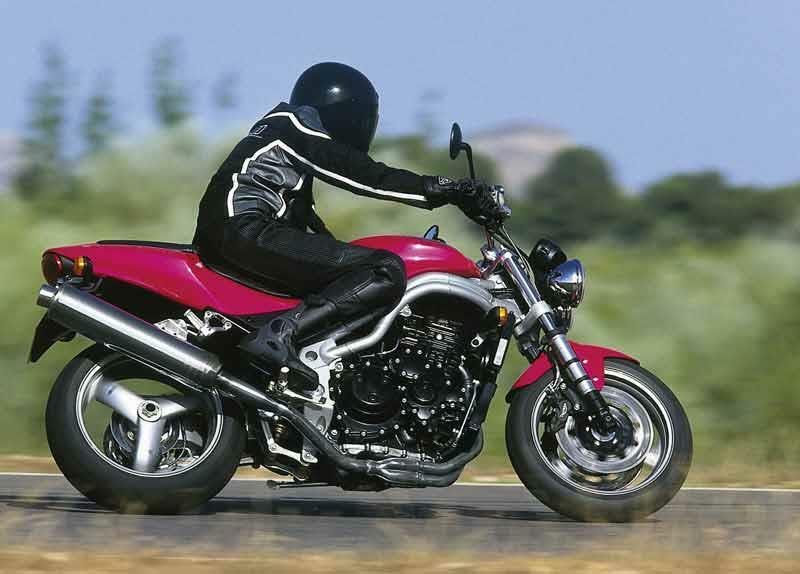 1997: Triumph T509 Speed Triple launched. 1998: Now with higher bars. Replaced late in year by 955i engined version. 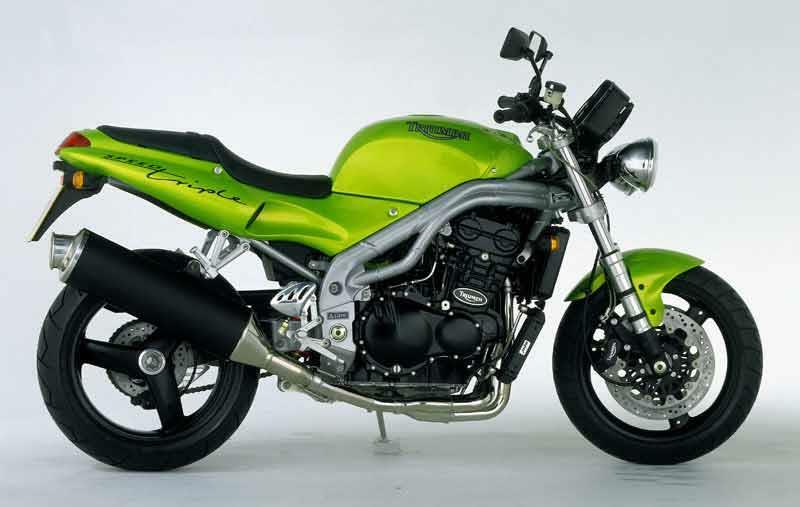 2001: Numerous engine modifications, restyled seat, new exhaust. 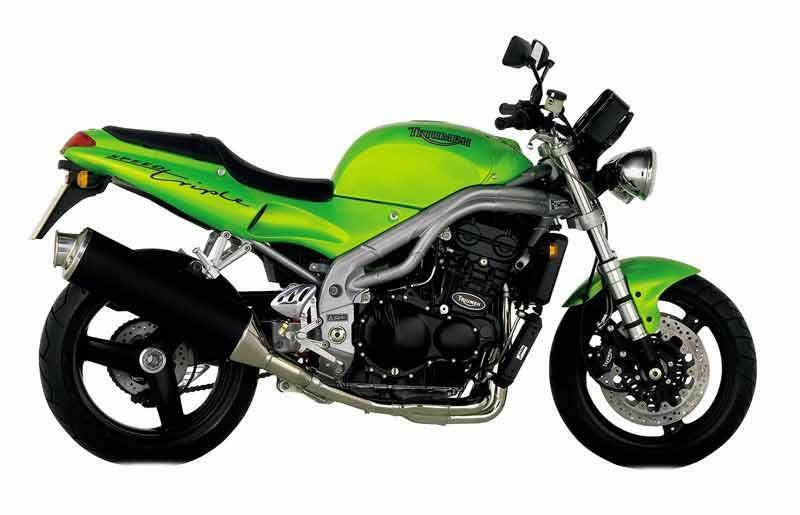 2004: Model discontinued, replaced by new 1050 Speed Triple. 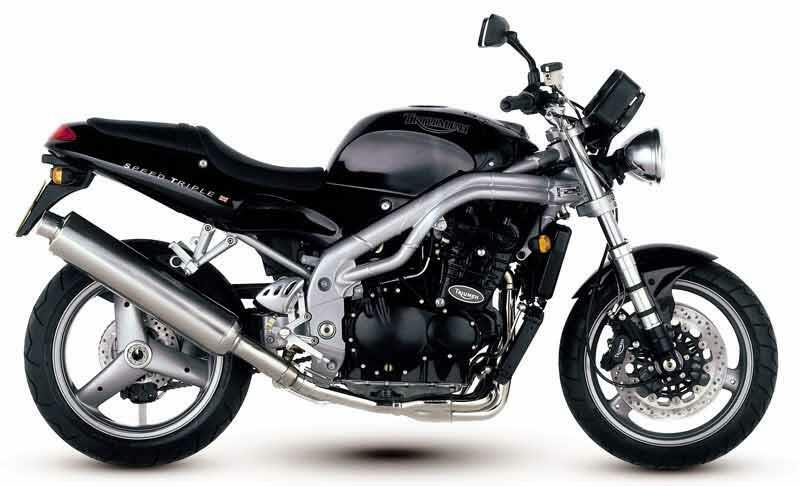 Speed Triple Special Edition: All black paintwork, 2004 only. Had mine a couple of years, so good it's been nicked twice. I'm tall and find it comfy enough to blat about all day. No strain on my poor old back. Won't keep up with pocket rockets but growls when she needs to. Looks pukka, plenty of comments if you like that sort of thing. She overheats quick in traffic and the fan kicks in about 103. Check oil level frequently. Mirrors need to come off as they look ugly, and then you're good to go. Average 130 miles before fuel light comes on. 21 litre tank. All round fun. 4-hour ride to Devon? No pains or aches. Commute, fine, just keep moving to stop the overheating (like any sports). Solid build. 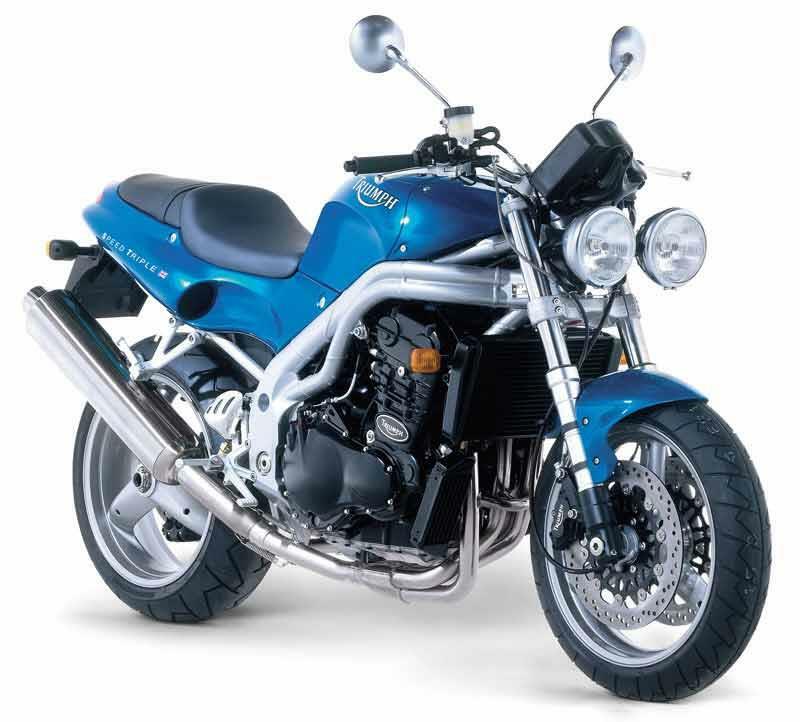 Thin coated Triumph paint. Had the starter/sprag clutch replaced @ 20K. Luck of the draw. Shovel luggage rack for trips and some panniers if you wanna eat after work. No real space under the saddle apart from a disc lock or spanners to get to the battery (2003 version). Dealer £3500 with about 18K and all the accessories on her. Belly pan, bikini fairing, rad guards and luggage rack. Not bad. It looks incredible, especially in roulette green. Does everything bar off road nonsense. Commuting, track days and touring. No fancy electrics, traction control, etc. It's just you and the bike!! Rides well solo or loaded with luggage for overseas touring. 150 miles before fuel and leg stretch required. Brakes good. Power just right. Who needs 165 bhp? Solid lump of (mostly) British metal and plastic. Wears well. Fork seals and speed sensor have been replaced. Corrosion minimal. Just keep it clean. Mine lives outside under a cover and doesn't get ridden in winter. Keep battery charged up or it will die !! 40 - 50mpg. Uses no oil between services. Triumph dealers expensive for servicing...only use if you have to. Find a local mechanic. Twin round headlights still look the part and the colour (only thing spoiling new Speed Triples is the lack of round headlights and a roulette green option). Fit heated grips and a Triumph high-level race pipe (if you can find one). Michelin 2CT tyres or Avons are recommended. Bought from (very good) dealer in Suffolk 4 years ago. Paid £3500 I think. Very low mileage at the time...now approaching 25000. Ride is sportsbike firm so it does tend to crash through potholes. However a two up ride from UK to German border last year proved they can tour if you compromise on luggage. More lovely triple torque than I'll ever need. Private £4000 8 years ago. Great looking and very eye catching bike. Good quality parts and exceptional paint quality. Enough power for most (120bhp) and enough torque to tow a caravan! Original can very heavy and best replaced with carbonfibre end can. Very reliable but if any check lights come on it's best to get a dealer to cancel them to ensure no gremlin problems occur. Only servicing I do is change the oil and filter every 3000 miles. Had it just over a year ,it had less than 6000 miles on the clock and is an 04 i have put another 5000 miles on it in just over a year.only warped discs spoil the picture otherwise it has been spot on.fitted a fuel can plus the fly screen and a visor for from bullster in france,it has made a big difference and to my eye looks a lot better than the laminar version.My third triumph and i have loved them all.ny last being a sprint st that is now embedded in a fiat punto !only problem now is that it has turned me into a hooligan.oh well. had my speed triple a year now and love it to bits, however the piston rings have gone with only 9000 miles on it, i bought the bike from a triumph dealer (two wheels in edinburgh) the problem with the rings started within my warranty period but i was basicly fobbed off leaving me with an expensive repair, The attitude of staff at this dealer was appauling. this has not put me off the bike though and it will be fixed for summer, AVOID TWO WHEELS IF YOU ARE IN SCOTLAND, THEY ARE A BUNCH OF COW BOYS!!!. Just picked up a used speed four, it was actually a trade down from an old zxr750 so as the speed is a modern bike, theres not much trade off top end, but the acceleration of the four blows the old kwak out the water. bikes got a lovely mid-range that just wants to pull all the way to the redline, but is just as good in 6th potterin round. it handles like a dream, you can just throw it down into anything because you know you can trust the chassis and the incredible stopping power of the brakes. look past the looks which you either love or you hate personally i think it looks so unique that you have to love it. It is truely an amazing package, take one out and give one a try I promise blast some b roads and you'll want to hand over the cash!!! Strengths: Chassis, brakes, engine. Weaknesses: Looks bit 'unique' for most middle of the road/fashion following people. 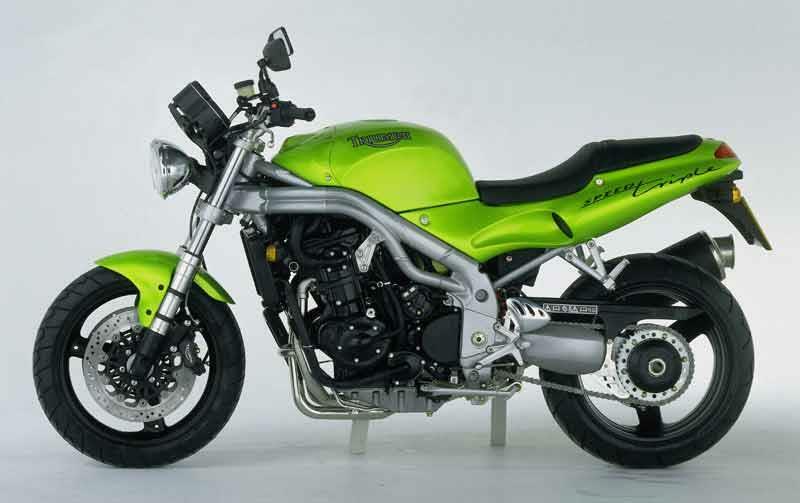 If its a 600 mid range bike you're after this should definately be one to look at. With very few around and radical looks (gotta love those air intakes!) and some unusual colours to choose from (get it in GREEN, it goes faster!) its guaranteed to turn heads. Although I haven't ridden many bikes but I know this one has amazing handling, it gives me that extra confidence going round corners and even though I've spun the wheel out a few times it always gets itself back upright with little effort. With so many speed cameras and the such on the roads these days it can handle any speeds your likely to ever go. It tops at 148 so unless you are going to do track days you dont need any more. The power is there so getting it up to the ton takes very little time, tho you really dont want to stay there too long as the small fairing becomes pretty much useless at anthing over 80-90mph. So far had no problems, apart from the Scottish weather. Strengths: Looks, handling, Noise (not like those Japanese hairdryers), so far no problems. Weaknesses: Little wind protection. 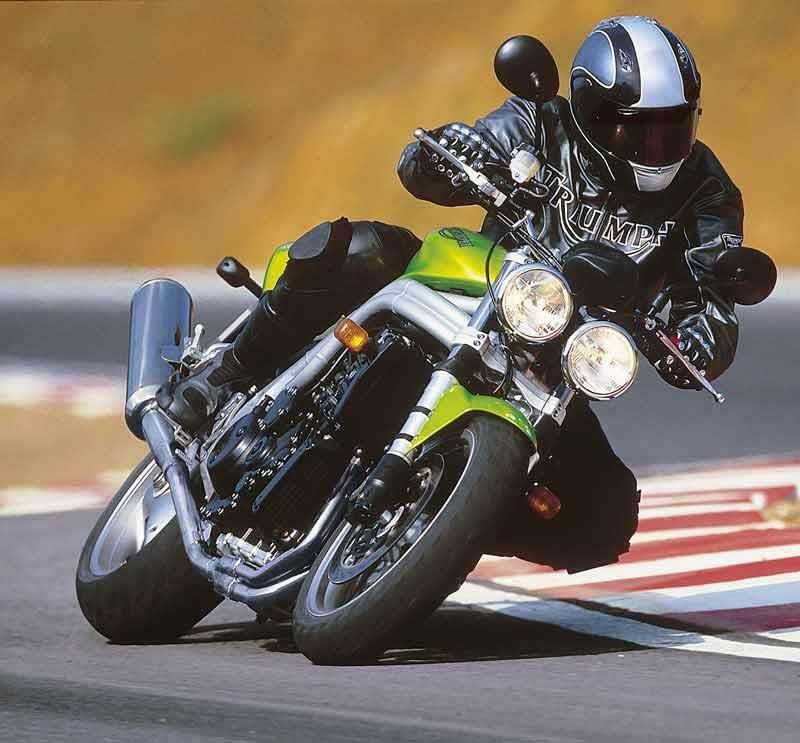 The Triumph is one of the best looking naked bikes on the road with very distinctive looks to set it apart from the rest. The engine has got a nice bit of power for when you want to be a bit of a hooligan but is let down by the fuel injection that is a bit notchy at low speeds but don't let that put you off because it is a very well made machine that anyone would love from experienced to novice, so make sure you take a look before deciding on something else as there are some good deals going. Strengths: Power, distinctive looks, good brakes, excellent build quality and a hell of a lot different from the rest of the naked bikes out there. 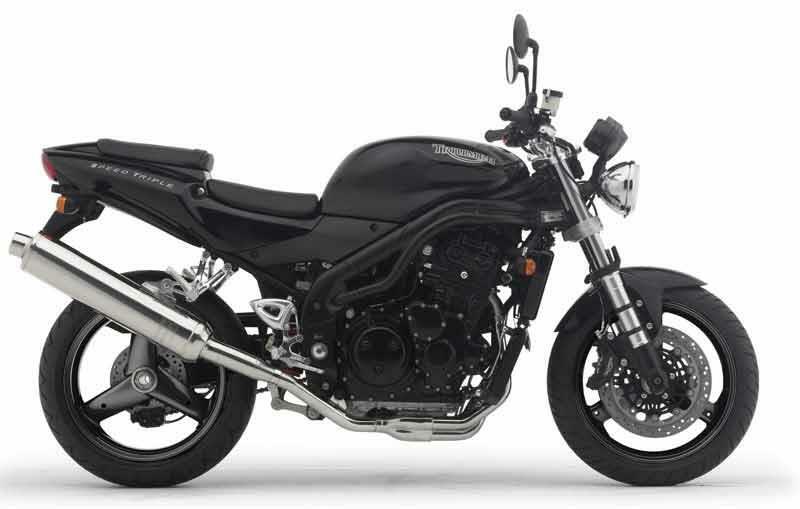 Weaknesses: Fuel injection is notchy at low speeds and wind protection but what do you expect when you buy a naked bike. Not just another mid-range four! This is a little hooligan! Yet when the adrenalin has got too much and you are going too fast too late into the corner...those excellent brakes and the exquisite handling pull you out of trouble every time. It is civilised when you need it but a twist of the wrist has the needle bounding towards 13k with a beautiful induction yowl. This is the four stroke LC reborn! Strengths: Handling, eager engine, brakes, style, handling & brakes. Weaknesses: Poor wind protection above 90. poor gearchange below 4,000.